This delicious almond cake is named in honor of Santiago (St. James), the patron saint of Spain. Every July 25th, the feast day of St. James is celebrated nationally in Spain. His remains are buried in the city of Santiago de Compostela, Galicia. During the Middle Ages, the pilgrimage to Santiago was the most important pilgrimage of the Christian world. Today, many people still make the trip to Santiago not just for religious reasons, but as a cultural, historical or active vacation. The cake’s origin is not certain, but it may have been brought to Galicia by a pilgrim and enjoyed by many who completed their journey to Santiago. Today, this cake is sold all over Santiago de Compostela and is popular with tourists as well as pilgrims. This recipe calls for blanching almonds before grinding into a fine powder. 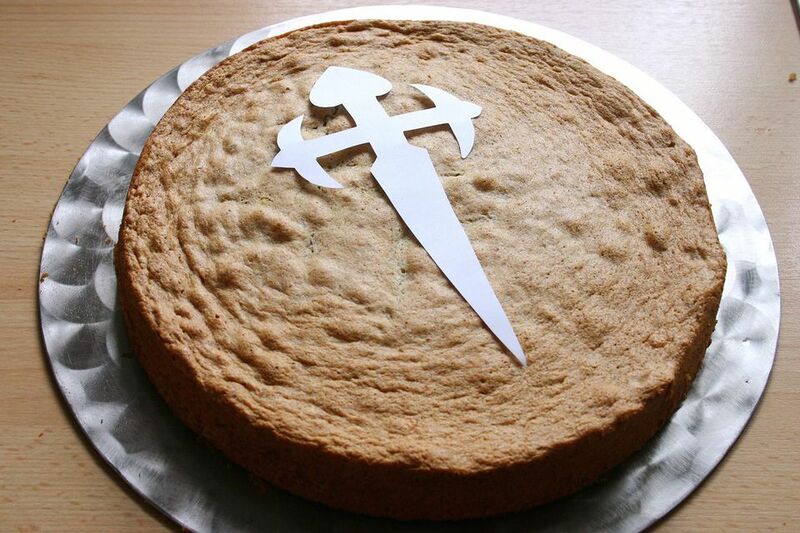 The top of the cake is decorated with powdered sugar creating a silhouette of the sword or cross of St. James. Heat the oven to 350 F. Grease a round 8-inch springform pan. In a large mixing bowl, beat the eggs and sugar together. Add the butter, flour, baking powder, and water and beat with an electric hand mixer until well combined. Stir the almonds into the batter. Add the lemon zest and stir until thoroughly mixed. Pour batter into prepared cake pan. Bake in the oven on the middle shelf for approximately 45 to 50 minutes. Check doneness after 45 minutes--cake is done if a toothpick inserted into the center of the cake comes out clean. The traditional way to decorate the cake is to sprinkle powdered sugar with a cut-out of the sword of St. James or a cross on top. To create a cross, use any clean piece of paper folded in fourths to cut out a cross. Then, after the cake has cooled, place the cross in the center of the cake and dust the top with powdered sugar. A small flour sifter works well for this job. Remove the paper to reveal the silhouette.